Our stiff League course from the Isabella Plantation provided the anticipated home advantage,with Matt Hyett’s team responding well to his invites. With 3 from the 13 at the first fixture not available,it was indeed heartening to still field 17 runners. The returns of Neil Wellard and Michael Huntley to our top contenders ensured our overall match points total was 125 better than in M1 and we grabbed 4th place of the 9 clubs,in the process stretching the gaps to the 3 clubs below us. We remain 5th overall at the halfway stage of the season and,though the 2 final matches are in Beckenham(Jan 13) and Croydon(Feb 10),involving tricky journeys,we will be accompanied across to Beckenham Place Park and Lloyd Park by the 3 clubs below us,all from our side of Surrey. No need to emphasise how much we will need our M2 squad in action in full again – and others!. After the brief preambles and an appropriately reverential Minute’s silence,and spontaneous applause,for the Fallen on this Remembrance Day,a slightly larger M2 field of 217, from M1,looped away from the start onto the 2 Lap Course. Guildford’s John Sanderson and K&P’s No1 Scott Evans soon established their familiar authority,which took them well away from virtually the whole field apart from a handful within half-a-mile,and,barring a fall on what had become a rather slippery testing course after early morning rain,there was an inevitability about the outcome up front. 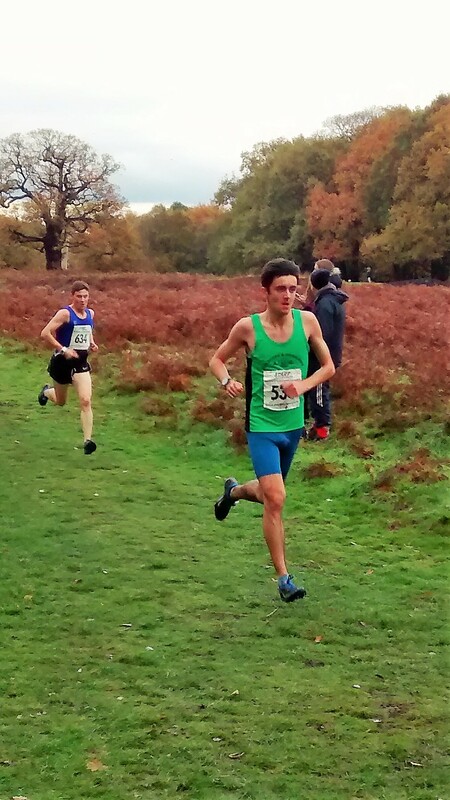 This time,however,K&P’s Neil Wellard had made significant inroads into League leaders Guildford & Godalming’s overwhelming throng of green vests. As the field passed our Timekeepers and onto the last lap,Scott & Neil were well into single figures and repeat Surrey M40 Champion,Matt Atkins,was well-placed to keep in touch with leaders. Michael Huntley was handily placed,too,though the K&P pack were doing just that,the gap between them and our 4 up front looking to be similar to M1. Sanderson and Scott Evans were duly first into view from around the north of Isabella,both mirroring their M1 finishes in 1 and 2. 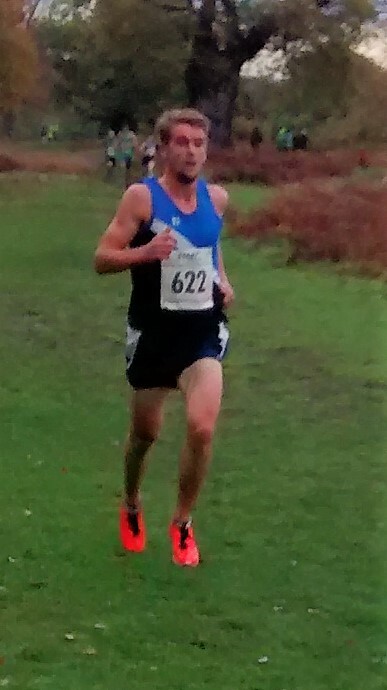 Neil Wellard,working hard as ever,took a fine 4th place,and with Matt Atkins forcing his way into the top ten(a fine 10th),and Michael Huntley taking a useful 28th,we looked to be heading for an improved final team placing. Alex Thomas(49),M40 Mark Reed(55),again sparing time from Germany,Matt Taylor(56),David Wilby(71), and M35s Matt Hyett(75) and Jamie McCullagh(80) saw us complete with 430 points. Whilst the League placings,surprisingly,remained the same,we are only 2 match points behind Dulwich,and,more,significantly,we have extended breathing space ahead of E&E,Windmilers and DMV,going into 2018. There was a mightily successful effort,off-piste as well as on-piste,from our CC Sec/TM,Matt Hyett,making organising a home fixture,in conjunction with wife Tukki, competing and TMing look like a piece of cake. Be sure that is not so;those in the know are truly aware of what occurs behind the scenes. The admin. matched the occasion,with as smooth a fixture as you could imagine – only a couple of breakfasts in the funnel. The Club is indebted to our own – Susanne Dietrich,Sue Shilling,Brenda Ford,Frank Schubert,Peter Shilling,Graham Huntley,Ant Budarkiewicz,Geoff Reed,Cashel Riordan,David Hillyer and Tukki and Matt,as well as Matt’s and James Robertson’s parents who were our further contributions to the marshalling. 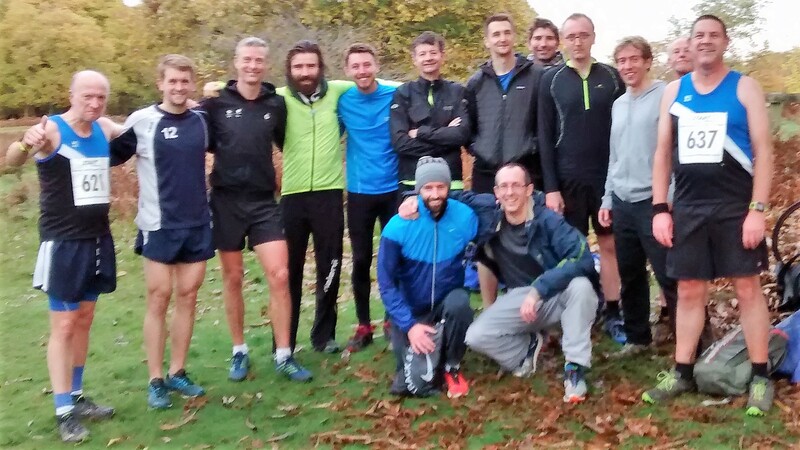 Nevertheless,we also have to offer our considerable gratitude to Fulham Runners,who were good enough to supply at least 8 of their members out on the course,with help also from Dulwich Runners in the funnel. Peter Wilkins and a recovering Mike May were also at hand in support,as well as some family supporters inc Jess Maranzano. The Day was a credit to our Sport. James Robertson(getting back to form) 106,Chris Gibbons 110,M40 Mike Maranzano(it looked hard!) 166,M55 Rupert Bole 190,M50 Mark Reynolds 207,M60 Mike Edwards(what a sprint finish!) 213,who was just ahead of former K&P King of CC,Bob McDonough(now M70 and just pleased to be competing) in 214th. Enjoyable indeed – ‘Not Half’,as Alan Freeman would have said. (sorry,very ancient reference).